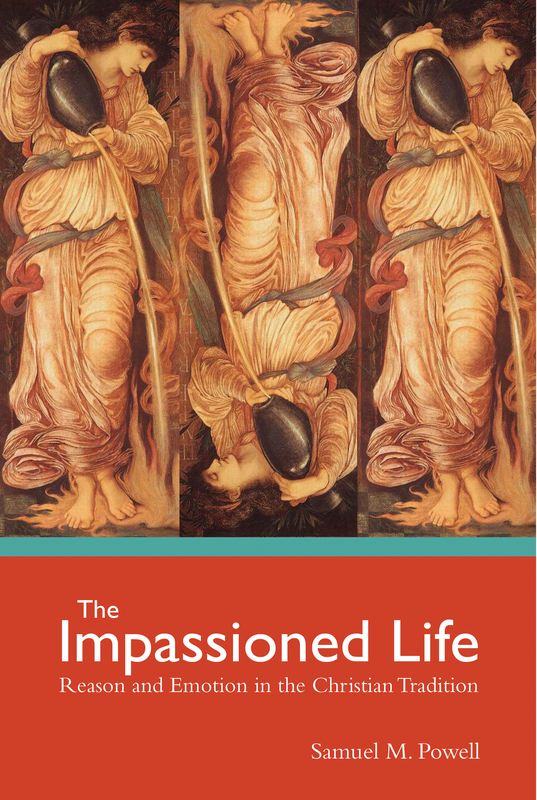 The Impassioned Life: Reason and Emotion in the Christian Tradition is my latest book, published by Fortress Press and due to appear early in 2016. About the cover art: This is a painting by Edward Coley Burne-Jones (August 28, 1833-June 17, 1898). It represents Temperantia, the personification of temperance, or moderation–one of the chief virtues traditionally associated with humanity’s emotional life. Because I wanted to produce a study in the Christian doctrine of creation, and specifically theological anthropology, and I was not satisfied with the general state of scholarship in this area. Many books treat the doctrine of creation in a strictly theological way–without incorporating the results of scientific study. I was convinced that today theological engagement with the sciences is both necessary and salutary. Other books on creation do engage the sciences; however, the majority of these deal with cosmological issues (Big Bang cosmology, quantum physics) or with evolutionary theory. As important as these studies are, they don’t address the concrete realities of human nature. I was initially interested in the Christian idea of freedom and then realized that, relative to freedom, the main theological and pastoral concern of the Christian tradition is emotion (construed broadly enough to include feelings, affects, impulses and desires). It is emotion that is morally and spiritually problematic. Human rationality, on the contrary, is rarely regarded as a problem. Quite the contrary, the Christian tradition has usually identified the image of God with rationality. So, I thought I could contribute to Christian thought by reviewing the concept of emotion in the formative centuries of Christianity and by incorporating the insights of scientific research into a theological understanding of emotion and its relation to reason. The Impassioned Life argues that theology’s task today is to rethink the nature of the emotions and their relation to human reason. Such rethinking is necessary because the Christian tradition feels ambivalently about the emotions. Armed with a commitment to body-soul dualism, many writers have equated the image of God with rationality and wondered whether emotion is an essential feature of human nature; however, the tradition has also affirmed the value of emotions such as love and compassion and has sometimes asserted the value of so-called negative emotions such as anger. The question, then, is whether the tradition’s pastoral insight into the importance of moderation and control of the emotions requires us to think dualistically about soul (identified with reason) and body (the seat of emotions). To answer this question, The Impassioned Life explores the vital resources of the Christian theological tradition and also of contemporary scientific and psychological research in order to achieve a more adequate theological understanding of the emotions and reason. At heart, it offers a holistic, integrated vision of the Christian life lived passionately in its full range of human feeling as life in the Spirit. I’ll add reviews as they are published.